The following group types are not accepted by this hostel: Business Trip, Stag/Hen/Bachelor Party If you have misrepresented the type of group you are booking for, your booking may be cancelled by the hostel." Central location, relaxing huge backyard with bar, great staff, well-equipped kitchen to use. Welcome to Tirana Backpacker Hostel! 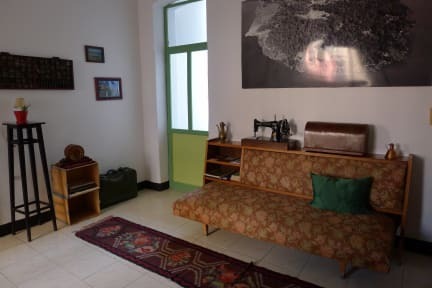 Albania's First Hostel, opened in 2005, it's located in a beautiful almost 100 year old Italian style villa, in the heart of colorful Tirana, close to Skanderbeg/Skenderbej Square. We have plenty of common relaxing space, a huge backyard, with lots of mandarin and orange trees, hammocks, sofas and instruments around! We offer free breakfast and vegan dinners, fantastic day tours and lots more! Come and experience Tirana Backpacker Hostel! The hostel was amazing! The staff were so informative as soon as I arrived, and continue to make the atmosphere really friendly and warm. Cleaned daily, always hot water when you take a shower (even at night), many common areas which are all comfortable, the breakfast in the morning is varied, the location is great (very close to the square and restaurants/bakeries on the street a couple of minutes away), and the place is very relaxed generally (use as many towels as you like etc). This place was amazing! Location was great! It's right next to a grocery store and about a 10 min walk from the city center. Maybe a 15 min walk from the bus station. The staff was so helpful and fun! Renato especially great. He was always getting to know the guests and recommending great places. They also have a cool hostel doggo! You should definitely stay at this place if you want to have a exceptional experience in Tirana! If extending my stay twice doesn't say it all, I don't know what does! 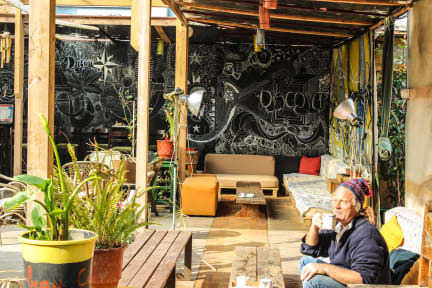 Fantastic hostel with friendly staff, delicious meals and welcoming atmosphere. Everything is clean. Location is central. For just €2 you can have an in house vegetarian dinner with all the guests. Outside is a wonderful common room with hammocks and lounges. I loved my stay! Perfect location, knowledgeable and helpful staff (Thanks Risa who really went above and beyond for me ). Great atmosphere, lovely decorations, easy to get to and around. Beautiful dog too. Hostel was clean. Walkable distance from bus station. Everything was good. No social vibe. Very nice and friendly place. Clean. Close to the city center. Breakfast was good, especially oranges :) The place is completely vegetarian. Thanks for everything guys! Hope to see you soon again. The place is very conveniently located to the city centre and main attractions. Staff are very helpful with getting around. The place is completely vegetarian which is fine, but they don’t say this until you arrive.